Cuccinelli campaign: Terry McAuliffe must call for Bob Filner to resign. The Cuccinelli campaign would have you believe Terry McAuliffe tacitly supports sexual harassment. Ken Cuccinelli’s campaign is trolling Terry McAuliffe pretty hard. Anyone following the Virginia governor’s race knows that Cuccinelli’s campaign is zealous in sending out torrents of email blasts. 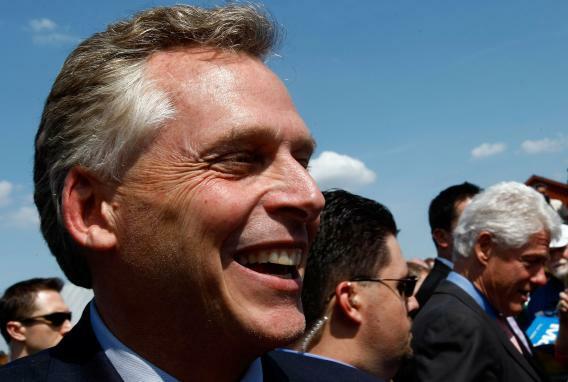 Most of the emails criticize Terry McAuliffe for his failed electric car startup or his prominent (and, as Mark Leibovich writes in This Town, perpetually flaunted) connections to the Clinton family. Finally, and only after significant public pressure, Democrats like Nancy Pelosi have started calling on the disgraced San Diego Mayor to step aide. Even the Democrat National Committee plans to vote on a resolution calling for his resignation next week. Of course, not every Democrat has joined Pelosi and others in calling for his resignation. That list includes Terry McAuliffe and President Barack Obama. With their silence, McAuliffe and Obama are signaling to people that it’s okay for powerful American leaders to harass, humiliate and assault women. One of the most fundamental parts of leadership is being able to stand up to your friends and tell them when they are wrong. Apparently, McAuliffe and Obama haven’t been able to do that with Filner. This is a pretty desperate attempt to distract from what’s actually being talked about in Virginia. Of course Terry thinks Filner should resign but Virginians are far more interested in Ken Cuccinelli’s track record on women’s issues, including his refusal to sign a letter in support of the Violence Against Women Act, sponsoring legislation to ban common forms of birth control, and proudly proclaiming himself the Virginia Senator most dedicated to outlawing abortion. McAuliffe leads Cuccinelli by 6 points, though Virginia voters don’t seem particularly impressed with either of their options. The Cuccinelli camp’s spin—“McAuliffe is tacitly endorsing sexual harassment!”—becomes even more silly when you consider the fact that there are a lot of legitimate reasons to criticize McAuliffe. He’s still winning female voters 50–38 percent.